The Arabic Network for Human Rights Information (ANHRI) announced today that the Ministry of the Interior has been obstructing and suspending the Public Prosecution and judiciary’s decisions to release some prisoners and detainees, for days and weeks, and even for months, such is the case in “Dar al-Salam” Metro detainees where it exceeded three months; on the pretext of waiting for the “National Security’s command or approval” especially in political cases. The Interior Ministry has also been expanding the use of this practice, which tramples over the law and overrides the judiciary’s decisions, in a way that makes it resemble a new phenomenon that undermines the rule of law and curtails citizens’ rights. 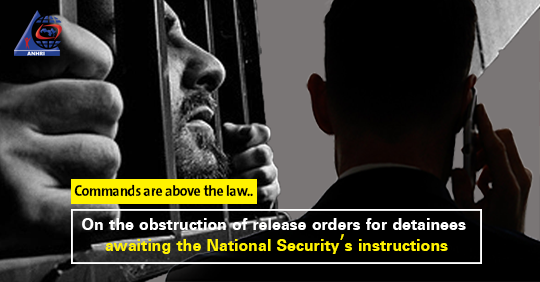 This is tackled in a report entitled “Commands are above the law… On the obstruction of release orders for detainees awaiting the National Security’s instructions”, which monitors manifold cases where decisions by the Public Prosecution and the judiciary have been suspended, or haven’t been implemented until after receiving the approval of the National Security Apparatus, and in some cases the approval took several weeks which those who had been ordered to be released spent in custody in violation of the law. The case of blogger Wael Abbas is the latest episode of this phenomenon, which is not monitored in the report because he was released before it was ready to be published. However, Abbas is still being illegally detained until today and so far has spent 6 days in detention becoming the latest victim of such phenomenon. The report includes 6 examples of those cases that took place during 2017 and 2018. Unfortunately, neither the Prosecution nor the judiciary can claim that they are not aware of such violations; since they have received many reports complaining about the Interior Ministry’s disregard for release orders, which have become merely some words on papers that can only be executed with the approval of the Ministry of the Interior represented in the so-called “National Security’s command”. This new phenomenon is added to the phenomenon of prolonged pretrial detention that has become widespread in Egypt. Both the judiciary and the police share the responsibility of the phenomenon of refraining to implement the judicial release orders, while the judiciary and the Prosecution bear the responsibility of the prolonged pretrial detention, and as a result, citizens’ rights and freedoms in Egypt has become just a thing of the past.